PHOTOGRAPHY BUFFS may already know about the “hidden mother” in early photographs, but some of my readers may not. So—this is for them. Shown above are two recently auctioned tintypes, both of which are excellent examples of this 19th century phenomenon. You see, most infants during that time were photographed with their mothers holding them. 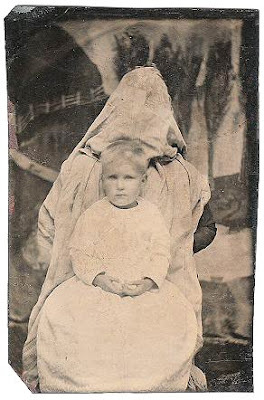 The intended picture was ultimately headed for a frame or mat, so the child would sit in the mothers lap for the photo. When the picture was taken, the mother simply was cropped out to serve as the backdrop. In the top right photo, I have shown a suggested cropping, with the mother cropped out. Without a mat, the photos are decidedly creepy—but that's the way it was (under the mat), over 100 years ago. 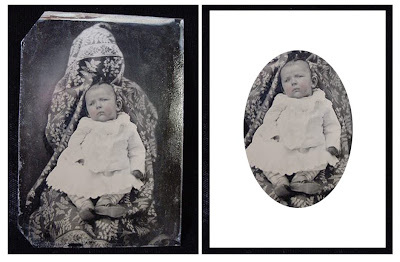 “Hidden Mother” tintypes are highly sought after by collectors. This is an Accidental Mysteries re-post from December 2008.
awesome! i love learning stuff! Great examples of Hidden Mothers. I am fascinated with the phenomena and loved your post. Thanks! Very creepy, but something I can look for now. Thanks for the education! hello there:) i agree with PaperSponge, this is slightly creepy, but in the best way possible. Fascinating! I've never heard of that. Thank you so much for this. I have read something about the Hidden Mothers phenomena a while ago. This post just made my day. Very interesting. black and white photo is so appealing! I can't find the words for it. it's just stunning my friend.